Students living with all sorts of housing instability — no matter how and where they find a place to sleep — suffer academically, according to a new report. The report's findings could have a broad impact as the number of doubled-up and unsheltered students statewide has nearly tripled since 2007. It should surprise no one that students living on the streets or in shelters and cars might struggle in school. But until Tuesday, it wasn’t clear whether the tens of thousands of children in Washington who spend their nights crashing with friends and relatives, also known as doubled-up or couch-surfing, would need as much help to succeed academically — and subsequently need extra help. 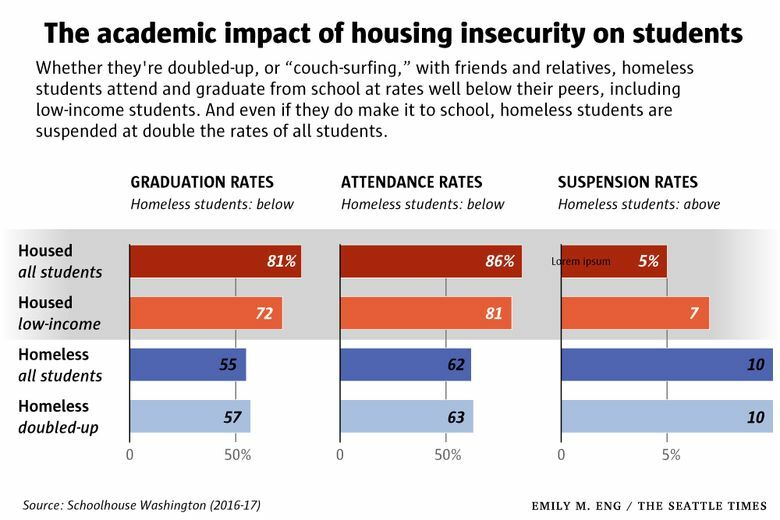 As it turns out, the growing problem of students living with all sorts of housing instability — no matter how and where they find a place to sleep — suffer academically, according to a new report from Schoolhouse Washington. The report’s findings could have a broad impact as the number of doubled-up and unsheltered students statewide has nearly tripled since 2007, forcing schools to stretch the limited resources for homeless students and prompting calls for Olympia to boost support. “Homeless is homeless is homeless,” said Liza Burell, program director of Building Changes, a nonprofit that works to reduce youth and family homelessness. Burell oversees Schoolhouse Washington, the group’s initiative to support the educational success of homeless students in Washington. The new report may be the first to directly examine the impact of different living arrangements on homeless-student success. And the findings, according to Burell, contradict assumptions that the growing number of doubled-up students have an easier time in school than peers living in even more precarious circumstances. About three in four of the state’s roughly 41,000 homeless students spend their nights doubled-up or couch surfing due to loss of housing or economic hardship. 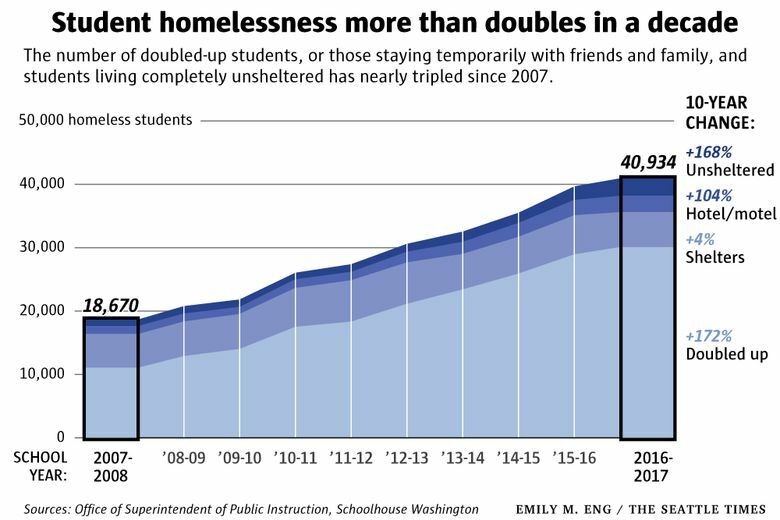 Federal education rules categorize the remaining 10,800 homeless students in Washington as living in shelters or transitional housing, hotels or motels, or with no shelter at all. Matt Lemon and Annie Pennucci, co-authors of the Schoolhouse Washington report, found Washington had the sixth-highest number of homeless students in the 50 states and the District of Columbia. And at 3.6 percent, the Evergreen State also had the eighth-highest share of students experiencing homelessness, according to the report. School districts have gotten better at identifying homeless students, which qualifies them for a limited pool of federal support. But Nate Olson, spokesman for the state’s Office of Superintendent of Public Instruction, said better identification only explains part of the rise of homeless students in Washington. “We’re pretty sure we’re out of a recession. For the numbers to continue to increase, it’s pretty disturbing,” he said. As for their academic outcomes, only about a third of homeless students, regardless of their nighttime residence, were proficient in English. Just a quarter were proficient in math. That’s well below the 60 percent and 49 percent rates that housed students posted in English and math, respectively. Similar gaps held true on attendance, graduation and suspension rates; enrollment in college-level courses; and ninth-grade course performance, which is a strong predictor of whether students will graduate on time, or at all. Lemon, the report’s main author, noted that even low-income students who aren’t homeless outperformed homeless students, a sign that measuring outcomes for students with unstable housing captures more chaos than merely the effects of living in poverty. Burell and Lemon acknowledged their report raises more questions than answers, including why 28 percent of black homeless students live in shelters compared with just 13 percent of all homeless students, and why about half of Washington students experiencing homelessness are concentrated in kindergarten through fifth grade. Even without answers, the report’s authors hope it triggers more attention to homeless students during next year’s legislative session. Washington state each year receives just $950,000 explicitly earmarked for homeless students from the federal government — or about $23 for each student. But over the past few years, the state has offered individual grants to help school districts pay for transportation for homeless students and pay for their tutoring, school supplies, clothing and even immunizations. The Office of Superintendent of Public Instruction plans to ask lawmakers next year to pay for more counselors in middle and high schools, and for family engagement positions. By December, a state work group will submit its own list of recommendations to the Washington Legislature to close the academic achievement gaps for foster and homeless students by 2027. Dawn Rains, chief policy and strategy officer for Treehouse, a Seattle nonprofit that serves students in foster care, and a member of that work group, said the recommendations could include making it easier for students to access state programs if they move from another state or have no parent in the picture. Bigger-ticket items could provide funding to pay for more seats in the state’s subsidized preschool program for homeless students, Rains said.